Philosphy products are designed to enhance your skin and well-being with multitasking benefits and uplifting messages that create a fresh, approachable attitude toward beauty. 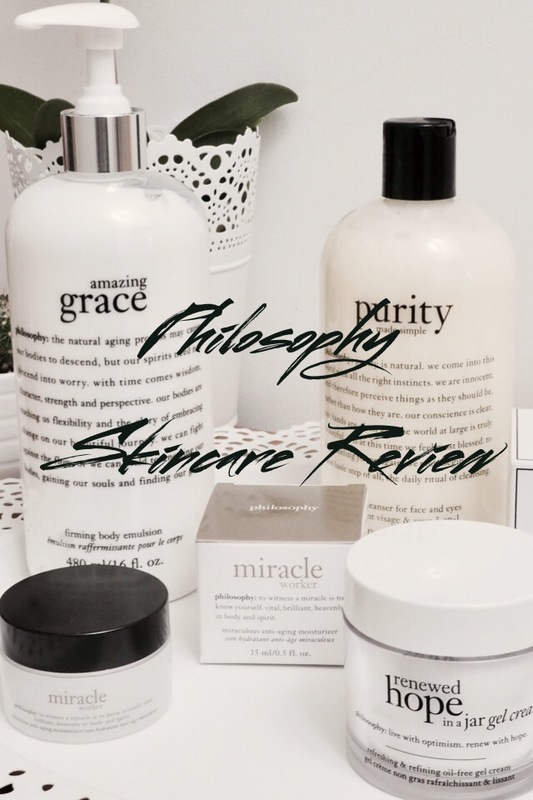 Philosophy skin care helps you reveal radiantly beautiful, impeccably smooth, youthful-looking skin. the formulas are proven to be effective yet gentle, for optimal benefits. created with doctors and scientists using proven ingredients, our exceptional skin care delivers visible results. each product has a story. each story speaks to the heart of our brand with science-based skin care and inspiration for clinically-proven results. 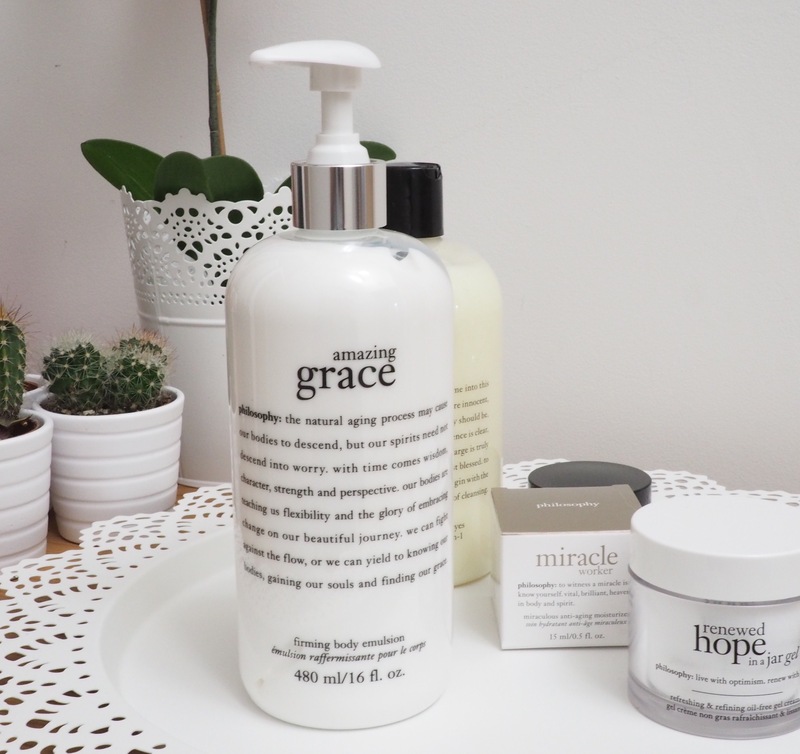 Philosophy Skincare donates 1% of their profits to the Hope and Grace Initiative. They donate a portion of their profit from all sales to mental health organisations. This is certainly commendable. Ingredients- aqua/water/eau, cyclopentasiloxane, stearic acid, glycerin, butylene glycol, c12-15 alkyl benzoate, glycolic acid, dimethicone, polyacrylamide, cetearyl alcohol, phenoxyethanol, sodium hydroxide, c13-14 isoparaffin, dimethicone crosspolymer, ceteareth-20, ammonium acryloyldimethyltaurate/vp copolymer, polysilicone-11, acrylates/c10-30 alkyl acrylate crosspolymer, laureth-7, citric acid, chlorphenesin, mandelic acid, tocopheryl acetate, synthetic fluorphlogopite, ethlhexyl palmitate, propanediol, parfum/fragrance, disodium edta, adenosine, evodia rutaecarpa fruit extract, limonene, faex/yeast extract/extrait de levure, magnesium stearate, opuntia coccinellifera flower extract, silica dimethyl silylate, caprylyl glycol, bht, ethylhexylglycerin, hyaluronic acid, silanetriol, sodium hyaluronate, sorbic acid, hexylene glycol, bismuth oxychloride (ci 77163). 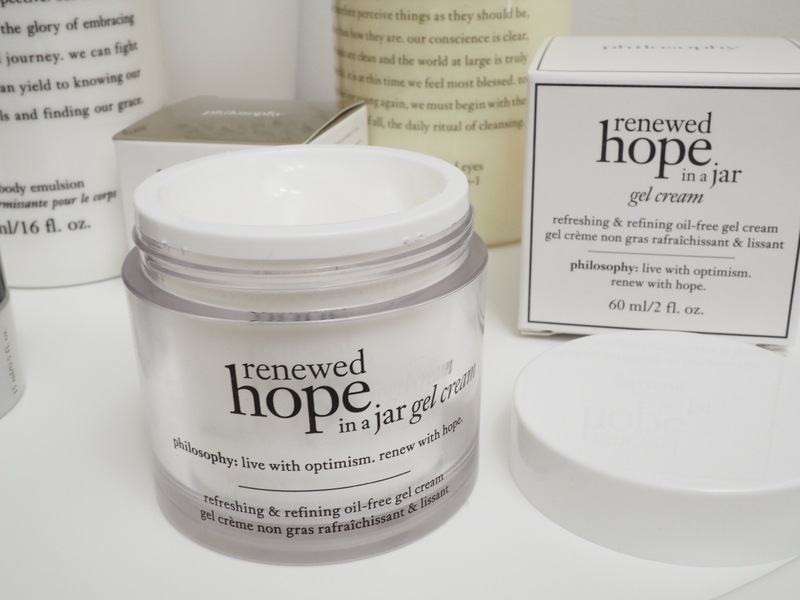 Renewed Hope in a Jar gel cream is an update on Philosophy’s classic Hope in a Jar. Renewed contains different acids for exfoliation- glycolic acid, citric acid, sorbic acid and mandelic acid. Although Renewed Hope contains acid, it doesn’t have so much acid that it stings. The acid ingredients are a welcome addition to any anti aging product. Acids are great for the skin, they exfoliate, smooth skin’s texture and lessen fine lines. The only issue I have is that it comes in a jar. Products stored in a jar go off more easily and can be contaminated when you put your fingers in it. I wish it came in a pump. Renewed Hope in a Jar is easily absorbed and has a nice lemony floral scent. I loved the acids and the way it soaks into my skin, I’m not delirious about the perfume. It’s described as a gel cream which means it’s lighter and less oily than most moisturisers. Renewed feels very light and absorbs beautifully. Renewed Hope is a good moisturiser with exfoliating actives for normal to oily skin. Ingredients- water/aqua/eau, cyclopentasiloxane, glycerin, dimethicone, peg/ppg-18/18 dimethicone, ascorbyl glucoside, behenyl alcohol, propanediol, resveratrol, hexyldecanol, helianthus annuus (sunflower) seed oil, zea mays (corn) oil, glutathione, macadamia integrifolia seed oil, olea europaea (olive) fruit oil, sesamum indicum (sesame) seed oil, linum usitatissimum (linseed) seed oil, bisabolol, stearic acid, cetylhydroxyproline palmitamide, brassica campestris (rapeseed) sterols, beta-glucan, butylene glycol, cyclohexasiloxane, benzyl alcohol, arginine, polysorbate 20, tetrapeptide-21, sodium hydroxide, phenoxyethanol, chlorphenesin, ethylhexylglycerin, disodium edta. I really like this cream, Miracle Worker is my pick of the bunch (typical! It’s the most expensive). It contains a stable Vitamin C (ascorbyl glycoside) and powerful antioxidant Reservatol. The ingredients list also includes moisturising plant oils, anti aging Tetrapeptide-21. Philosophy has done some research into the effectiveness of Miracle Worker- In 8 weeks, 96% of 49 women showed dramatic reduction in the appearance of wrinkles. I can’t say I saw a dramatic change to my skin as I haven’t used it for a full 8 weeks. I’ll update with any exciting results. I love the texture of Miracle Worker- it’s very soft and quickly absorbed. It has the slightest scent of almonds, it’s almost fragrance less. The texture is very light and absorbs to leave a matte finish. It works well under makeup. It’s less heavy than Renewed Hope in a Jar (and more expensive) but it’s also in a jar. Miracle Worker is an anti aging moisturiser (although I would describe it as more of a mattifying primer with actives) and is s great choice for oily skin. Ingredients-water (aqua), sodium lauroamphoacetate, sodium trideceth sulfate, limnanthes alba (meadowfoam) seed oil, coco-glucoside, cocos nucifera (coconut) alcohol, peg-120 methyl glucose dioleate, aniba rosaeodora (rosewood) wood oil, geranium maculatum oil, guaiac (guaiacum officinale) extract, cymbopogon martini oil, rosa damascena extract, amyris balsamifera bark oil, santalum album (sandalwood) oil, salvia officinalis (sage) oil, cinnamomum cassia leaf oil, anthemis nobilis flower oil, daucus carota sativa (carrot) seed oil, piper nigrum (pepper) seed extract, polysorbate 20, glycerin, carbomer, triethanolamine, methylparaben, propylparaben, citric acid, imidazolidinyl urea, yellow 5 (ci 19140). £29.50 might sound like a lot of dough for a cleanser, but you get a whopping great pint bottle of it. It could probably last you all year. They do smaller bottles- 90mls for £8.50 so you can try it out to see if your skin likes it. You can see from the ingredients list that the top ingredients, the foaming agents are sodium lauroamphoacetate and sodium trideceth sulfate. These are found commonly in shampoos for babies. They’re much less drying than sodium laureth sulphate, the most used foaming agent. Then comes a list of moisturising natural agents. Cymbopogon martini oil sounds like fun! (Its lemongrass oil, it’s good for soothing). It’s hard to pin down the scent, it smells a bit like alcohol. Philosophy Purity 3 in 1 is indeed gentle enough to use near the eyes. I used it to take off my mascara and there was zero stinging. Purity doesn’t foam up a great deal but it does leave my skin very fresh and clean. After a couple of weeks exclusive use my skin was rather dry. My skin can be a bit like that, I know a lot of reviewers don’t get this problem but for me it was a little drying. It’s going to be something I use when I need to cleanse and remove all my makeup quickly, but personally I will not be able to use it on a daily basis. Philosophy Purity 3 in 1 Cleanser for face and eyes is low foaming and gentle for the eyes, but left my skin a bit dry. Ingredients- water (aqua), fragrance (parfum), macadamia ternifolia seed oil, isocetyl stearoyl stearate, glycerin, olea europaea (olive) fruit oil, dimethicone, glyceryl stearate, butyrospermum parkii (shea butter), cetearyl alcohol, cetyl alcohol, polysorbate 60, peg-100 stearate, stearic acid, phytosterol/octyldodecyl lauroyl glutamate, tocopheryl acetate, potassium ascorbyl tocopheryl phosphate, xanthan gum, carbomer, diazolidinyl urea, triethanolamine, methylparaben, propylparaben, tetrasodium edta. Amazing Grace perfumed firming body lotion is scented and rich and comes in a handy pump bottle. Fragrance is high up in the ingredients list on this one. Next on the list is macadamia nut oil, shea and olive oil. Amazing Grace is white in colour and quite thick in consistency. It spreads well and you don’t need much to cover arms and legs. It has a strong scent when you first apply- like shampoo, sun cream and, according to my husband, balloons. But this dies down when it absorbs, to a clean fresh floral scent that lasts really well. Amazing Grace is advertised as suitable for dry mature skin, but I think anyone could use it, it’s not heavy. The cream absorbs and moisturises well. Similar to the Purity cleanser, you get a lot of product for £29.50 and it might be worth trying a smaller size first to see if you get on with the perfume. I don’t know how much firmer my skin was after using, the skin texture was smoother for being moisturised. Philosophy Amazing Grace perfumed firming body lotion is a rich moisturising cream with a clean floral scent. 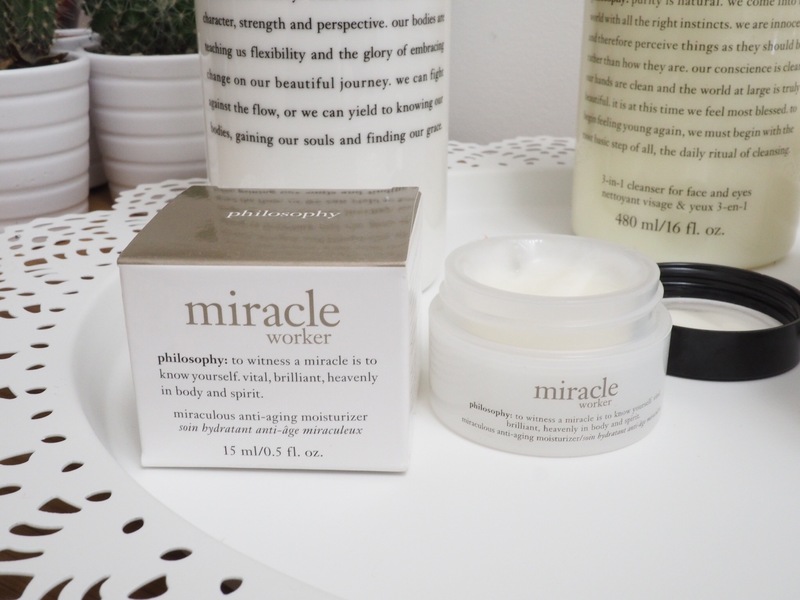 Out of the Philosophy skincare products I’ve tried, my favourite is Miracle Worker. And I love that some of the money you spend on Philosophy goes to charity. Do you have a beloved Philosophy skincare product? Let me know in comments. Thank you Philosophy Skincare for the PR samples. Please note that the links are affiliate. I was not paid for this post and my views are my own.